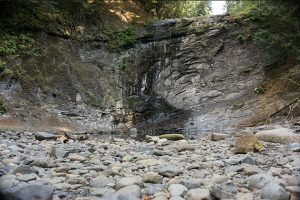 This week we will share with you our third and final waterfall visit in Nanaimo BC, Ammonite Falls. These falls are listed as a 20 minute hike, but even on the sign people have crossed off this optimistic suggestion! On many blogs I saw suggestions from 30-40 minutes to the falls. I would say it took us at least 45 minutes to walk to the falls, probably more like an hour. Tim and I talked about this later and noted that the first time on a trail usually takes longer because we are unfamiliar. The trails are well kept but you will definitely need hiking shoes. There are some varied ground with inclines and declines. The most challenging part of the trail is at the falls themselves. This part is a steep cliff down to the falls. At this point you can scale down the cliff using the support of the ropes. I have been on hikes before with ropes for support, but honestly you would not be able to do this part of the hike without the ropes. This part of the hike definitely raises the level from easy to moderate. In the summer months, when there is not rain, it is not possible to see the falls from the top, so you need to be in good enough shape to scale down the roped incline if you want to see the falls. 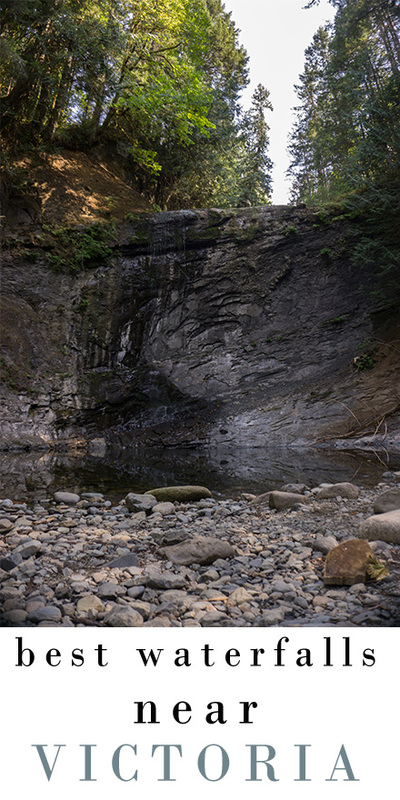 As with all our Nanaimo falls, we would love to return once rainy season starts to see the falls with more water.